(Bloomberg) -- Donald Trump’s political fortunes changed in an instant after the Justice Department announced that Special Counsel Robert Mueller hadn’t found evidence that the president or his campaign colluded with Russia to interfere with the 2016 election. Trump’s oft-uttered and equally oft-mocked claim -- “no collusion” -- proved true. The president won’t face re-election under a cloud of distrust about his connections to the Kremlin. He and his staff are freed from an investigation that preoccupied his White House. "We are all very glad it’s over and we can move forward and focus on things that really matter," White House Press Secretary Sarah Huckabee Sanders said Monday in an interview with NBC News. Democrats who had long hoped Mueller’s report would provide enough ammunition to politically handicap the president, if not impeach him, face new questions about their own credibility after years of insinuations and conspiracy-mongering. The opposition party must recalibrate not only its approach to the Russia investigation, but also its messaging on a host of fresh investigations House Democrats have launched into the Trump administration and the financial affairs of the president and his family. The hope for Trump, and the danger for Democrats, is that probe-weary voters may feel that Mueller has spoken and it’s time to move on -- just in time for his 2020 re-election campaign to begin in earnest. That’s a distinction without a difference in the Oval Office, where Trump’s absolution in the inquiry reinforces his political brand, long rooted in personal grievance and his depiction of himself as a victimized outsider. “To be honest, it’s a shame that your president has had to go through this -- before I even got elected, it began,” Trump said. The president, of course, risks squandering his newfound political momentum. He was dogged by Mueller’s probe not out of a Democratic conspiracy but because of his own actions and those of some of his advisers -- five of whom were convicted or pleaded guilty to felonies. He may miscalculate his political capital, advocating for new, extreme policies that could alienate moderates key to his re-election, or issuing pardons for allies convicted in the probe who remained loyal, such as his former campaign chairman Paul Manafort and former National Security Adviser Michael Flynn. Congressional Democrats have warned him against the latter move. Already on Sunday, Trump said he wanted “somebody” to “look at the other side,” suggesting vengeance and score-settling was top of mind. 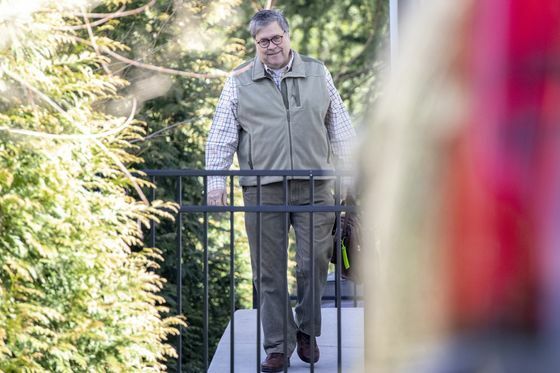 White House spokesman Hogan Gidley told reporters traveling with Trump that there were no plans to ask Barr to investigate Democrats. And the president has shown a penchant for wading into controversy. Ahead of Mueller’s report last week, Trump dismayed his own party by dusting off his attacks on Senator John McCain, now seven months dead. Nor is Trump completely out of the woods. Findings in the Mueller investigation inspired new legal inquiries into the president’s payoffs to women who have alleged extramarital affairs, as well as possibly illegal donations to and spending by his inaugural committee. And the White House’s public enthusiasm for Barr’s four-page summary of Mueller’s findings makes it harder for his administration to argue that the special counsel’s full report can’t be made public. Its release could reveal embarrassing or unethical behavior by the president and his staff. Still, Sanders said Monday that Trump likely wouldn’t discourage the full report’s release. "I don’t think the president has any problem with it," she told NBC. "He is more than happy for any of this stuff to come out"
The president’s re-election campaign leaped to capitalize on the news of Barr’s letter, releasing a video stitching together clips of Democrats claiming Trump had colluded with the Russian election interference scheme and appealing to supporters for donations. Within hours, the campaign issued a fundraising appeal under Trump’s signature offering to quadruple-match donations received by midnight Sunday. “Democrats and the Fake News media have proven that there is no line they won’t cross, so we need to fight back BIGGER AND BETTER THAN EVER BEFORE,” Trump wrote. Mueller’s conclusions are a relief far and wide in Trump’s orbit. The investigation cost many White House aides and outside advisers tens of thousands of dollars in legal bills, public harassment and reputational harm. They can safely turn their attention back to policy making and the president’s re-election. His vindication also provides Trump a cudgel to use against proposed examinations of his taxes, personal wealth, or use of the presidency to benefit his private businesses. If Mueller’s probe was a goose-chase, he may argue, why should taxpayers foot the bill for more? The president reveled in the new reality of Washington as he returned to the White House on Sunday night. “I just want to tell you that America is the greatest place on Earth,” Trump told reporters, smiling slightly, before entering his home. He took no questions.